What Makes a New School Tattoo? Characterized by a more cartoon-ish style, the new school tattoo has exploded in popularity starting in the 70s. These traits characterize this unique style. Tattoos come in a wide variety of styles, ranging in color patterns and overall design features. Many people choose a tattoo based on significant events in their lives, and sometimes just for fun. Depending on your tattoo style preference, it can be difficult to choose just one. That’s why tattoo artists commonly promote different styles and designs. They are constantly drawing, coloring and practicing their craft to better influence followers. Don’t get stuck with a tattoo that doesn’t represent you or your tattoo artist at their best. Choose a new school tattoo, instead. Here, we discuss the different features of a new school tattoo so that you can make an educated decision on your new tattoo design style. Perhaps the most influential characteristic of a new school tattoo lies in the color schemes. They are bright and undeniably non-traditional. New school tattoo colors differ from old school tattoos in the use of the color palette and the skin. Old school tattoos or traditional and neo-traditional tattoos use one part color, one part black or grey, and the other part skin. New school designs borrow from this style, but with bolder and brighter elements. This type of design generally includes colors like ultra light blue, deep lime green and different shades of purple. They’re extremely colorful no matter what subject you choose. Another feature that you will find in a new school tattoo includes the use of 3-D shading. There is a heavy influence in how the shading interacts with the skin that creates the three-dimensional effect. New school tattoos tend to be more un-realistic overall and this can be found throughout the shading techniques. Your tattoo artist may use different techniques to create drastic effects that allow the tattoo to stand out and make an impression. One of the characteristics in a new school design that compares with an old school tattoo is the use of heavy outlines. This influence is important to the design features of a new school tattoo in order to incorporate classic elements of tattoo culture. The use of heavy outlines adds to the color sensation of these pieces because of the grand contrast. Because of the use of bright colors, 3-D structure shading and heavy outlines, a new school tattoo looks like or represents cartoons and graffiti art. One of the ways to easily define a new school tattoo is to recognize any cartoon-like qualities. Cartoon tattoos are increasingly popular because the demand is growing for basic tattoos that represent more than the art itself. Subjects are often fantastical with novel patterns and include much room for customization. These designs incorporate color on a grand scheme. Because this art is exaggerated significantly, it also tends to reflect characteristics of graffiti art. Details within the subject are not realistic and might include jagged edges. Many graffiti style tattoos have themes from hip-hop culture. They are not restricted to traditional characters or subjects. Images of this nature are typically more abstract and easy to customize. Popular subjects include aquatic scenes and horror movie characters. The imagery in graffiti tattoos is a little more restricted in the use of colors, in comparison to cartoon tattoos. Whereas old school tattoo designs use scripted or block lettering, new school tattoos are more inclined to bubble lettering. Letters are enhanced with the use of the heavy outlining and shading techniques to make your color pop. Design features using bubble letters creates a lasting effect on your tattoo that will not soon go out of style. Unlike the jagged edges found in graffiti tattoos, bubble letters fit well with cartoon art or word-only phrases and words. 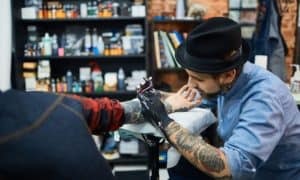 Many tattoo artists are becoming more open about their art in contrast to past decades when these same artists were more secretive with their work for fear of competition. These days, more artists are sharing their techniques and different ideas with a more relaxed form. This art has created a more diverse selection of artistry among those that are collaborating and designing new school tattoo designs. Some artists are becoming increasingly popular, showcasing their creative energy and artistic execution in styles that recognize your skin as the ever-changing, beautiful canvas that it is. This tattoo design doesn’t just cater to your artistic side. It also relates to your creative energy and ability to think outside the box. There are a lot of different concepts and mediums involved in this tattoo style. It only depends on what you can think up. Some fans of this style focus strictly on cartoon characters while others might use club affiliated designs or straight graffiti art. The whole idea is to be as bold as possible. Many tattoo artists appreciate the freedom of subject and technique that comes with this style of tattoo art. They are also better able to serve their customer’s ideas in true form. Getting a new tattoo is not for the faint of heart. Choosing a design takes time and finding the right artist to help you isn’t always easy. Select a favorite cartoon character and have your artist incorporate a selectively graffiti-like shading structure. Or let the artist decide for you! If you’re interested in a new school tattoo, get on board and give us a call. We have specialized artists and years of experience. You can pop by our Las Vegas Tattoo Shop, Henderson Tattoo Shop or Maui Tattoo Shop for more information and meet our artists.